Last Tuesday, a proposed bill to legalize physician-assisted suicide in California was shelved by its primary authors due to lack of support, and is unlikely to be voted on this year. Senate Bill 128, which passed the state Senate last month, would have allowed doctors to prescribe lethal drugs to terminally ill individuals seeking to die. Democratic state Senators Bill Monning and Lois Wolk, who authored SB 128, pulled the bill from the Assembly Health Committee’s schedule of hearings Tuesday after it became clear that enough Assembly Members would not support it to allow passage. Among the opposed Members were a number of Latino Democrats, making up about a third of the committee, who spoke against the bill in the context of their personal experiences. “I’m uncomfortable with the way suicide could be viewed across society, not just [for] the terminally ill,” contributed Assemblywoman Lorena Gonzalez (D-San Diego), whose mother lived past her doctors’ prognoses while terminally ill. Indeed, the general (non-doctor-prescribed) suicide rate in Oregon has been rising since 2000 and was 41% above the national average in 2010. Assemblyman Jimmy Gomez (D-Echo Park) planned to abstain if the bill came to a vote, citing a concern for the poor and uninsured who may see assisted suicide as their only feasible option if the bill passed. Gomez recalled growing up without health insurance and seeing his father postpone cancer treatment until it was too late. Elder and disability rights groups also oppose the bill based on the concern – shown in numerous cases – that a legal “right to die” evolves into a “duty to die” for members of their communities who may feel pressured. While assisted suicide proponents claim that these worries have not been borne out in reality for Oregon’s 1997 law (after which California’s is modeled), they often cite Oregon’s lacking state health department records. For instance, in response to Tuesday’s stalled bill, one advocacy group claimed there is not “a single documented case of abuse or coercion” in Oregon; however, the operative word is “documented” (in the state’s health department records). 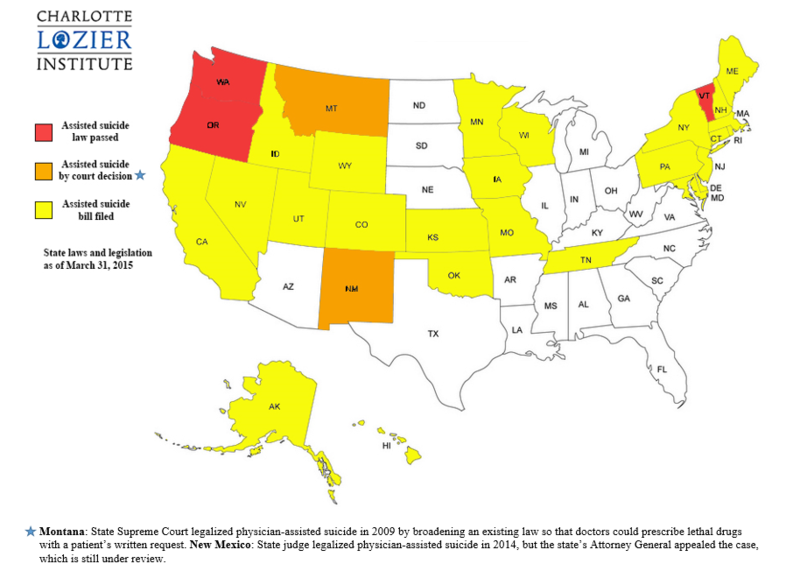 [H]ow would supporters of assisted suicide know the [Oregon] law has worked without abuse? State oversight depends almost entirely on physician self-reporting, and the state agency in charge of oversight readily admits it does not know about assisted suicides that are not reported. Moreover, even if an abuse is reported or somehow uncovered, Oregon officials admitted to a United Kingdom House of Lords investigative committee that Oregon’s oversight agency does not have the legal authority—or budget—to conduct independent inquiries even if a legal violation is uncovered. While this year’s defeat of California’s assisted suicide bill is a victory for pro-lifers and advocacy groups such as elder and disability rights groups, as well as religious groups, if a voter ballot initiative is already in the works for California in 2016, the urgency remains to continue to educate the public on the harms of doctor-prescribed suicide, as well as on the good of palliative and hospice care.